In which I revisit dinosaur nostalgia, realise I missed a lot of LEGO® Dinosaurs, before finally getting on the band wagon with the Jurassic Park Fallen Kingdom sets. We breakout the Stygimoloch, and take her out into the wild. Then, we look at the latest ‘Iconically Jurassic’ contest over at LEGO Rebrick. I was once, it will come as no surprise, a 6 year old boy. Like many such creatures, at one point I developed a fascination with dinosaurs. They consumed my waking hours, my conversations and dominated my visits to the local library. I could draw and spell them all by heart. 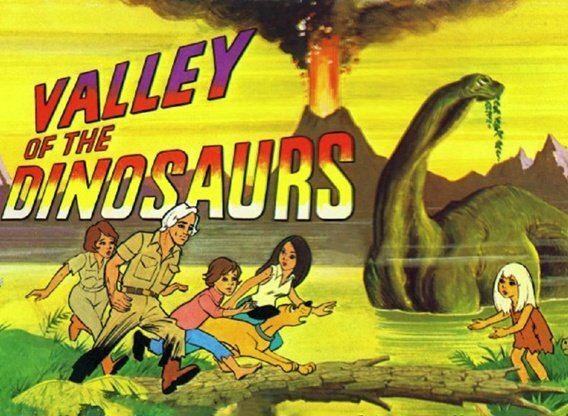 If I wanted to watch dinosaurs on television, I was limited to watching Valley of the Dinosaurs (a 1974 Hanna Barbera cartoon where a whirlpool in the Amazon transported a teacher and his family into a land that time forgot) or Land of the Lost – from the crazy team that brought us HR Puf’n’stuf and Sigmund and the Sea Monsters. For me, The Flintstones didn’t really cut it for me: it was really just a sitcom wearing animal pelts. 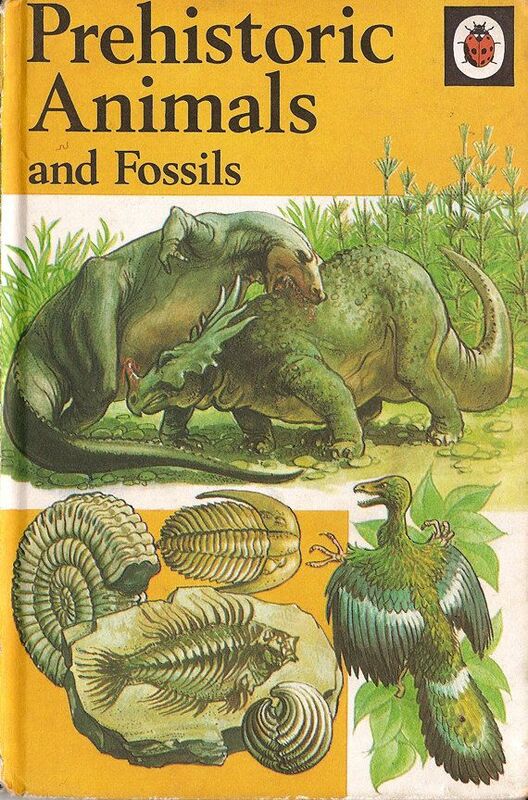 My favourite book of this era, the Ladybird Book of Prehistoric Animals and Fossils, was a favourite. Portable and sturdy with its yellow hard cover, there was always room for it in my school bag, or clenched between my knees when we went for a drive to the shops. It was a long night when I accidentally left it at school. I read this book time and again, able to recite portions off by heart. The final pages offered sage advice: If you have enjoyed this book, why not look further afield to continue expressing your interest – why not go searching for fossils or build a model kit; perhaps try making a paper mache diorama of a prehistoric landscape. Put a small lizard in it, and pretend it is a massive dinosaur. (to be fair, some of these ideas may have come from other books of this era). Now, I wasn’t a fan of actual lizards – scaly things which were hard to catch. Besides, around us, the most common were little skinks, which would drop their tails at the first sign of trouble. Or Schoolboys! So I looked to build a model. It was a three year search, but well worth it. Three towns and 16 toy shops before we finally found a model ankylosaurus to build. Low, spiky and well armoured, I seemed to feel a greater affinity with these plant eaters than the carnivorous apex predators. Time passed. Mercifully we avoided a mass extinction event! I fell out of love with dinosaurs, and grew older. Jurassic Parks I, II and III came and went, and it became almost impossible to enter the supermarket, let alone a toy shop or specialty education supply shop without being overwhelmed by the sheer number of dinosaurs on the shelves. And then my son developed his own fascination with dinosaurs. “Fantastic!” I thought. A common bond. Just the thing for a boy and his Dad. And the facts had changed. Virtually every dinosaur I had known and loved was smaller, bigger, more feathered or had a different name to the one it had back in the 1970’s. The angle of their bodies, as they walked became flatter, and they came to resemble, more and more, a giant scaly chicken! 5884: Raptor Chase, part of the 2012 Dino Range. Somehow I didn’t engage with this them. In retrospect, I don’t understand why this was the case. I missed a few waves of LEGO Dinosaurs, because they just were not on my radar. The 2012 Dino series came and went (complete with the bright green tranquilliser syringes) and so did Jurassic World. I’m not sure why these sets didn’t appeal to me. Perhaps there was too much of a ‘ gotta catch ’em all’ feeling with the multiple colours of raptor, perhaps the raptors just had no appeal for me, and the other sets didn’t have much appeal for me at the time. Skip forward to the present. The Jurassic World:Fallen Kingdom sets have recently arrived on the shelves. And I have been feeling strangely compelled to pick a set or two. Am I yearning for pop culture and nostalgia rolled into one? Am I just playing catch up? Or do I just want to keep up with the toy photographer community on #toydinotuesday? So I have a look at the current sets on offer: I don’t want to spend too much. Which is relative. These sets start at $30 in Australia, if you are looking for a pteranodon, and the price goes up if you are looking for something with legs. I am not looking for DUPLO, but the actual setting doesn’t matter to me too much. I am only really looking at the dinosaur. As I mentioned, for me, the raptors do not have a high level of appeal, although there are lots sets featuring them (10757, 75932, 75928, 75930). If you are looking for a larger dinosaur, we have several choices: Tyrannosaurus Rex, Indo Raptor and Carnotaurus. The T. Rex comes with 2 colours – the Juniors version[10758, $AU79.99] has the same colouring as seen with the original Jurassic World Sets, as well as lots of printed panels and the main gates. Carnotaurus, and the ‘new colour’ T Rex both come with vehicle heavy sets. Indoraptor comes with the stately home on the Lockwood Estate, but also costs $AU200. For me, the most appealing is the Stygimoloch Breakout set  The Dinosaur appears fairly unique amongst those available; there is a generic guard, as well as Doctor Wu. A small laboratory/incubator room and fenced enclosure completes the model. It is a quick and easy construction. While there is a sticker sheet, I have not applied them. I’ll look at them shortly. A pachycephalosaur (and indeed, possibly the juvenile form of the pachycephalosaurus), the stygimoloch has a bulbous forehead, as well as a number of ornate horns. Typically there are also two larger horns, surrounded by smaller ones, protruding from the back of its head. The LEGO Representation of this dinosaur is undoubtedly the standout star of this set. The LEGO version appears to re-use a collection of features from other LEGO Dinosaurs available this year. While some of these are obvious, looking at the other models, I would recommend you take a look at Elsbeth De Montes’ comprehensive review of the new dinosaurs for 2018 over at New Elementary. The body of the Stygimoloch is the same mold as that used for the Velociraptors and frilled Dilophosaurus. Its legs are those of the Dilophosaurus, and the arms are the same used with the Carnotaurus model. The head is a new mold, featuring a bulbous forehead, with multiple bumps and small horns around it. Its mouth is like a small beak. The back of the head also has four 3.18mm sockets to accept the standard ‘ bar’ fitting, which is the same size as that on the horns which we build in. The body is medium nougat, with a dark orange upper, as well as dark brown stripes. The printed eyes match nicely with gentle holding underneath. The face comes across as quite expressive, despite its immobility, depending on the angle at which you approach it from. The set comes with two mini figures: Doctor Henry Wu, chief geneticist at Ingen, as well as a guard, armed with a tranquilliser gun. Both figures feature front and back printing on the torso, and the guard has black and silver printing on his legs. Dr Wu always came across to me as having an air of haughty arrogance, as you might expect with someone playing deity with both a long extinct or a never previously evolved species. The minifigure captures this look perfectly, although on the flip side, he appears to have some regrets. The guard has no particular branding, and so could happily fit in in ant environment, regardless of third party licensing arrangements. The build is relatively simple, creating a pen fenced with live electric wires. The gate slides up, to allow a controlled release. Adjacent to the pen is a lab. On the desk is a computer, coffee cup and some incubating dinosaur eggs. The titular breakout appears to in fact be a break in, where Stygi breaks into the Ingen lab that is adjacent to the pen: knocking down the gate to the lab, upsetting Dr Wu’s desk and blowing out the window in the process. Chaos ensues, as our dinosaur upsets Dr Henry Wu’s desk, scattering eggs and knocking out the window in the process. After breaking out of the enclosure, we broke out of the house, and I took the Stygimoloch out for some evening photographs in the autumn dusk. The shadows from the horns varies with every movement of the camera, changing the overall shape of the creature. It is certainly a lot of fun. I dare say some more images might appear on the Rambling Brick Instagram stream over the next few weeks. I am impressed by the stickers included with this set. Most of them have the scope to be used in other contexts, without modification. There are electricity warning signs to attach to the electric fence; a generic access code/ key panel ready to attach to the door of the lab; some dinosaur specific information to make the desktop computer more useful; a farming light/striped pattern to put on the sliding gate, to warn passers by to mind their heads. There are dark bluish gray patterned stickers to give the feeling of textured metal and my favourite, the calendar. The Calendar makes it for me: check out the date marked. This year, the second Friday in June is marked by the opening weekend for Jurassic World Fallen Kingdom in half the known world. Unfortunately, not Australia. We will need to wait. I love these little easter eggs that are tucked away where you least expect to find them. They make me smile. This is one of the best sticker sheets I have seen for some time! The graphic designers have done a fantastic job with it. Although, I see such utility with these elements that I wonder whether they should be available as printed elements, especially the electrical hazard and textured metal prints. The contest closes for submissions June 1st at 10:00 a.m. EST. Which is your favourite LEGO Dinosaur set so far? Are there any sets in the Jurassic World series that you are especially looking forward to building? What do you think is Iconically Jurassic? Why not share your thoughts below!